* Welcome back to School teachers, staff and students! We look forward to a great year with you. * Our Parish Ice Cream Social, Cakewalk and Dance is Sunday Afternoon, September 14. Please save the date! Our Manna Food Project is also the weekend of September 13-14. Parish Life Weekend is the following weekend, September 20-21. * RCIA begins September 8. 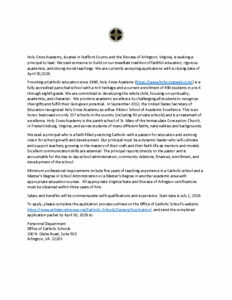 If you or someone you know is interested in becoming Catholic, please call and register in the parish office.